Description: Passive subwoofer with bass reflex loading. 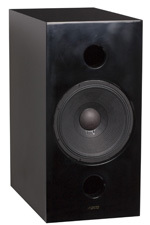 Woofer: 15” bass reflect design. 4” voice coil. Internal Wiring: Patent pending Time-Accurate cable design. Fully shielded and grounded. Binding Posts: 3 total including one for grounding. Unique design using the posts as clips only and not for conducting. Conductors are brought to the outside for direct contact with speaker wire terminals. Binding posts are extra large, widely spaced for ease of connecting; and gold plated for beauty and durability. Cabinet: Highest quality MDF with thickness ranging from 1” to 2”. Finish: Black piano finish on all six sides. Weight: Approx. 176 lbs (80 Kg). Placement: Can be placed vertically or horizontally. Remarks: This subwoofer is designed to reproduce accurate low frequencies at very high sound pressure levels with extremely fast speed that is capable of complimenting the speed of the drivers of the main loudspeakers.